Klik of the Month Klub #99 ideas? A 'training' event (maybe on October 17th) targeted at supporting first-time game developers that might like to participate in KotM #100. A spooky event along the lines of ones we've had around Halloween in the past. I'd hate to force these on others if they're not really wanted, so I'm keen to hear what other trainwreckers might have in mind. Keeping things as they are is obviously an option! We do have a lot of events planned for the month already. lol what game is this? 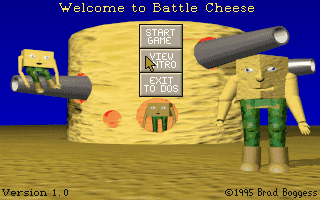 I'm going to go ahead and guess that it is Battle Cheese which was (I'm going to guess) a parodious spin-off of Battle Chess. lol Both. I mainly want to do a Halloween thing cuz I liked last years Halloween thing. I want it to be different but still Halloween. lol Maybe like a "Halloween Trick-Or-Treat Bag". I intend for this to be the year that I make a spooky game rather than a creepy one! I've had a year to think about the difference. Let's see what I've learned. The last Halloween event wasn't a Klik of the Month and it lasted 13 days and it was awesome. Sergio, you never made a game about existential realization!